Squirrels poster - gathering food Use for picture talk, room decor, theme focus. Squirrels poster or 6 piece puzzle. S is for squirrel trace and color. Squirrels alphabet upper case, plus 4 fall leaves to make a letter recognition game. Feed the squirrel center. Feed squirrel acorns with numbers, letters, colors and shapes. Squirrels-The Lost Acorns (song & game). Singing, hiding and counting. 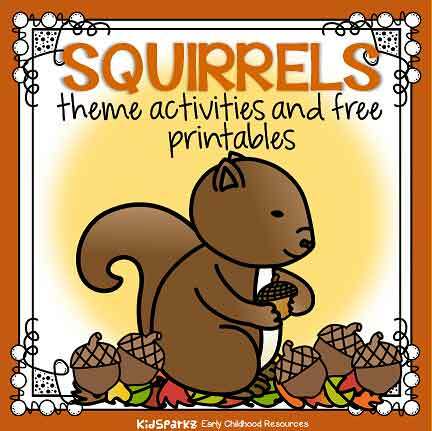 ​Become a site member to download these activities in the Member Library area on the Squirrels theme page. Packs that are free to members are labeled. Pre-K Themes Series - a collection of low-cost downloadable mini teaching topics/units that are focused towards preschool and pre-K learners.